Week 3 of the 2016 college football season is loaded with big games. The race to the College Football Playoff will be greatly impacted by this weekend. The top game of the weekend is Ohio State at Oklahoma. The Buckeyes go on the road against a Sooners team that doesn’t want to fall to 1-2. In the SEC, Alabama travels to Ole Miss. The Rebels have won two straight over Bama so the Tide will want revenge. Chad Kelly better be ready for the Tide’s fierce defense. Florida State at Louisville is a huge game for the ACC. The winner here becomes a favorite to win the ACC and make the playoff. 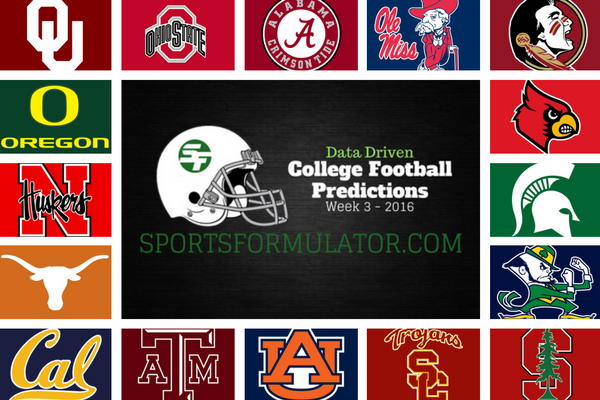 Using our predictive formula we’ve predicted every college football game on the board in week 3. We predict several upsets this weekend. Week 2 College Football results – 41 of 46 (89%) SU and 26-18-2 (59%) ATS. Think you can pick better? Play our Free College Football Pick ‘Em contests picking game winners and Against The Spread (ATS). Get College Football predictions all season long.